May 1, 2005: Noho ka Manawa I Hula Alapa’i had two performances at the opening of the cure season at Bad Durkheim, a city close to Mannheim. Karin was contacted by a lady who was in the organisation team of that opening event. She watched the Ka Imi performance at Mannheim Luisenpark in 2004 and was very impressed. So she asked us to perform at the cure season opening event. We had two performances of 20 minutes each. The subject of our 1st performance was Hollywood and dances of that period of time. In order to give an introduction, we started with a small story, which we created in order to explain the most common gestures for landscapes, the elements and people. We wore our grass skirts and rafia kupe’e while we performed Hukilau Song, Song of old Hawai’i, Green Rose Hula, He Nani ka ala and This is Hawai’i. The people were very pleased by the performance. Most of them had never seen Hula before. When we were walking through the cure park in our grass skirts, we attracted a lot of people who wanted to make fotos of or with us. During our 2nd performance we danced modern Hulas like Hawaiian Hospitality, Papalina Lahilahi, Ke ala ka’u i honi, Pua Mana and Kamali’i o ka po. We got a very positive feedback by the audience as well as the lady of the organisation team and the director of the spa. Back at home we watched the video tape of the performances, one of our husbands made. On that tape we could hear a small child sing “lae la lae la” after we finshed He Nani ka ala. 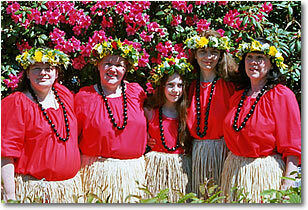 This really proves that Hula and hawaiian music is attracting young and old people – and not only in Hawai’i !